When we employ time to sit in the practice of meditation, affirmation, prayer or gratitude, with the primary intention of manifesting the things we believe are lacking in our lives, we end up wallowing in the awareness and frequency of lack. In that disempowering state, we fail to become a vibrational match to all the Goodness in our Vortex of Creation, the Core of our Inner Being that holds the vibrational equivalent of every good that we can think of.To desperately pine for or desire something, to believe that you are incomplete without that thing, to lean on desperation instead of preference, is to invite in the fear that what you desperately want may not come to fruition. The frequency of fear is not akin to that of the Vortex of Creation where all your good are stored vibrationally, waiting to manifest physically. The empowering prayer, gratitude or meditation practice is one that is done for the sheer joy and exhilaration of appreciating the abundant good in your life. In that joyful empowered state, you align with your Vortex of Creation and allow its good and inspiration to flow into your experience. First and foremost, we are vibrational beings, always translating signals. Whatever we’re giving our attention to is causing us to translate those signals. The Law of Attraction is matching the current signal that we’re transmitting now. We are vibrational beings, a transmitting and receiving mechanism, in a Universe managed by the Law of Attraction. We are Source Energy Beings. We were Source Energy before we came into our bodies. Although we are still in this body, we are still Source Energy. In fact, we are still more non-physical Source Energy Vibrational Beings than we are this flesh, blood and bone version that we think of mostly as ourselves. Simply put, a part of All That You Are is focused here in your physical body. 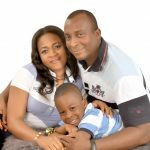 As we explore our physical experiences, we develop a personal point of view, a personal awareness and decisions of what we would prefer – how this can be better, the improvement in that. Knowing what we don’t want causes us to know what we do want. So, all day, everyday, we are radiating signals of desire or rockets of desire. The rockets of desire are animated by statements like “I want more money,” “I want more prosperity,” “I want more freedom to do what I want.” When we launch a signal or a rocket of desire, that vibrational rocket, that vibrational intention, that vibrational becoming is received by the non-physical part of us, our Inner Being. At the Core of our Inner Being is the Vortex of Creation, the vibrational version of us that precedes all manifest versions. As a result of our asking, the vibrational version of us, the non-physical part of us, becomes more prosperous. In view of this, the questions to ask ourselves are these: “what are we doing in relation to that inner prosperity and expansion, right here and now?” Are our thoughts and feelings a vibrational match to the thoughts of our Inner Being.” You can tell by the way you feel whether your focused thoughts in this moment matches those of your Inner Being. Feelings of elation, eagerness, excitement are indicators that you are in harmony with your Inner Being, that you are vibrationally up to speed with Who you have really become, that you are allowing your connection with your Inner Being, that you are allowing yourself to be the realiser of what you are asking for. On a different note, negative emotions of anger, frustration, jealousy, inadequacy are indications that you are a vibrational mismatch to your Inner Being. Your Inner Being holds expanded versions of you vibrationally in the Vortex of Creation. Negative feelings suggest that you are vibrationally out of harmony with what you have set into motion, the expansion in your Vortex of Creation, that you brought into being with your asking for more. Persistent thoughts that are mere justifications of lack prevent you from seeing, hearing, smelling, tasting and touching the things you called into being in your Vortex of Creation. Such nagging thoughts that make you a vibrational mismatch to the expansion in your Vortex of Creation include: “I want it because I don’t have it,” “I want that because I should have it,” “that person has it and that person has it; why don’t I have it.” In that question of what is missing, you are fostering, encouraging and continuing to practise a vibrational frequency that prevents you from realising what you are asking for. If you want more than the vibrational reality in your Vortex of Creation, tune in to it. When contrast causes you to ask, your desire becomes a vibrational reality immediately. Tuning into your Vortex of Creation is not something that you do instantly; it is a gradual process. In every case, it is something that you can do. The Vortex of Creation is vibrating at a very high frequency and it would be really good for you to raise your vibration to match the frequency of what is in your Vortex of Creation. When you are up to speed with what you have become, you’re tuned in, tapped in and turned on. Being in harmony with your Inner Being makes you feel wonderful, makes things to go well for you, gives you good timing and flexibility, and brings benefits to those around you. When what you are thinking about in this moment and giving your attention to in this moment is free of resistance, when you are not doing that thing you do that makes you feel uneasy, when you are not introducing into your vibrational frequency unwanted things, when you are in that place of allowing, when you have been meditating, when you’ve been praising, when you’ve been appreciating, when you’re in love, when you’re in a high flying good feeling place, when your emotions are telling you how good you’re feeling, then you are a perfect vibrational match to what’s in your Vortex of Creation. For that, what’s in your Vortex of Creation will flow to you through the path of least resistance. The realisation of it will be yours. When you are allowing the connection between you and your Inner Being, inspiration comes and you have a feeling about something. To just feel wonderful and clear-minded is the first evidence that you’re up to speed with your Vortex of Creation and its contents. When you are in harmony with your Inner Being, ideas will flow in and you’ll know that they are good ones. Thoughts are turned into things through focus and reception, and response to that reception. Even the economy and cells of your body evolve in this manner. Your Eternalness is all about the never-ending succession of evolution; it’s all about thoughts turning into things. It’s beneficial to start addressing yourself more vibrationally instead of physically because the physical parts of you and the physical things that you’re giving your attention to are already manifested, already done. Put your attention to where you are going. So, when life shows you that you want something, you want to be more forward-looking towards the evolving and unfolding of what you’re asking for. It pays not to stand where you are, sometimes in the absence of what you want, justifying or defending why you should get more of what you want because you don’t have it. Every subject is two subjects. It’s like a stick that has two ends. On one end is the absence of what you want and on the other end is the presence of what you want. When you ask for more money, where is your emotion? Are you standing in a feeling of desperation and disappointment or are you standing in an attitude of appreciation and anticipation? Where is your vibration relative to the things that you’re asking for. 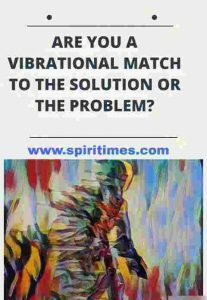 Are you more of a vibrational match to the problem or the solution. However it has turned out so far in your life experience is what you’re a vibrational match to. Nobody is withholding anything from you. Empowering feelings of Joy, Gratitude, tends towards the solution rather than a lack of it. You can tell what you’re offering vibrationally by what you’re living, by what you’re surroundedd with. 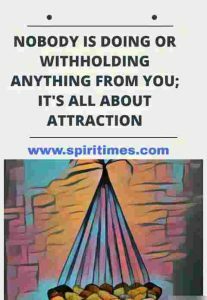 It’s always about attraction; nobody is doing or withholding anything from you.